Released on February 12, almost two months before the biopic PM Narendra Modi whose release has been delayed over allegations of violation of the Model Code of Conduct, Main Hoon Chowkidar has over 4 million views on YouTube. A still from the YouTube film Main Hoon Chowkidar. The fictional village of ‘Bharatpur’ is in turmoil. Thefts and robberies have increased, women feel unsafe, corrupt politicians rule and the neighbouring village of ‘Khanpur’ has residents worried. Bharatpur’s chief, an Armyman, suggests the village hire a new ‘chowkidar’ from ‘Gurjarpur’ to set things right and rid the village of politicians who either disconnect electric wires or steal fodder or appease Khanpur or steal stones to build statues in parks. This is the plot of a film shot in Uttar Pradesh titled Mein Hoon Chowkidar and released only on YouTube. Released on February 12, almost two months before the biopic PM Narendra Modi whose release has been delayed over allegations of violation of the Model Code of Conduct, Main Hoon Chowkidar has over 4 million views on YouTube. 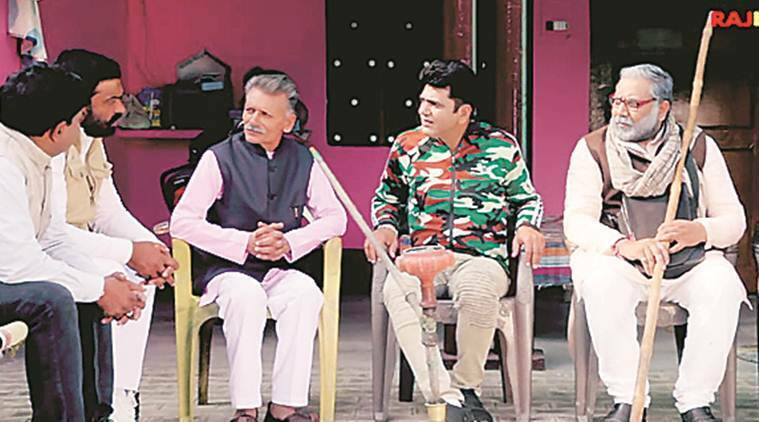 Its producer Vikas Baliyan, a resident of Muzaffarnagar, says the film was shot in 21 days in two villages in Moradabad and Muzaffarnagar, which vote on April 11, in the first phase, for a budget of around Rs 12 lakh. “I had this idea for a while about showing the truth of the situation in the country. The media keeps reporting on issues like the Rafale deal but the common man could not understand what was happening. This movie was made to help the common man understand,” he said. The film does not name a single leader but the characters are thinly disguised lookalikes of Arvind Kejriwal, Mulayam and Akhilesh Yadav, Mayawati, Sonia and Rahul Gandhi, and Lalu Prasad, while the chowkidar is clearly Narendra Modi. In the film, minutes after he is hired, the chowkidar roams the streets of ‘Bharatpur’ often saying “jaagte raho” and first encounters a person meant to resemble the Delhi Chief Minister attempting to climb an electric pole to disconnect wires. On hearing the watchman approach, the Kejriwal lookalike flees. The chowkidar next comes across a character ostensibly portraying the BSP chief, while she tries to steal stones to build statues. The Mayawati lookalike too flees on hearing “jaagte raho”, as does a character dressed up to resemble Lalu Prasad while trying to steal fodder. According to Baliyan, the film was also released under another name, ‘Mera Gaon, Mera Desh’ on YouTube, which has 1.7 million views. “We have tried to show the country within a village. Apart from political leaders, the film refers to the Rafale deal, which is shown as the procurement of guns, while Pakistan is portrayed as Khanpur,” said Baliyan. The film also highlights several NDA government schemes such as Swachh Bharat, Ujjwala and Saubhagya. In one scene, the chowkidar, who also teaches the village yoga, is seen convincing the Armyman to use the schemes to clean the village and improve sanitation. He also suggests making use of a scheme to replace wood-fired stoves with LPG and recommends using government money for street lights. “We released the movie on February 12, two days before the Pulwama attack and in that time we got almost 3.5 million views. After Pulwama, people stopped watching YouTube and focused on the news instead,” Baliyan added. As the movie ends, politicians complain to the Armyman that the chowkidar was hired for only five weeks, that his time was up and he should be fired. But people refuse, saying he has changed their lives and their village.